For high frequency, high isolation shielding requirements, engineers typically rely on relatively expensive solutions such as machined housing which also have the disadvantages of increased weight and board footprint. As an alternative 3G Shielding Specialties hybrid shielding offers the same performance as machined housings with a significant cost savings using the footprint of a traditional metal shield. 3G Shielding Specialties Board level shields are manufactured in a number of configurations and are typically available as single-piece shields or shields with removable covers. They may provide shielding for a discrete circuit or be comprised of a number of distinct cavities with a single cover. Manufactured from thin metal, typically copper-nickel alloys or plated mild steel, 3G Shielding Specialties board level shields offer a cost-effective solution and can be readily scaled from prototypes to high-volume production. In addition to their cost-effectiveness board level shields offer several significant advantages with respect to board design. 3G Shielding Specialties Board level shields can be designed in virtually any shape or size allowing for extreme flexibility in board layout. Shields can be placed on solder pad widths as low as 20 mils, they can be placed without the need of through holes (surface mount), and can be reflowed at the same time as other board components reducing the number of manufacturing steps. While every application is unique and shielding effectiveness is a function of shield and board design, generally speaking board level shields provide 60 dB isolation for frequencies up to 10 GHz. At higher frequencies board level shields are susceptible to a loss of isolation between cavities and leakage between the cover and fence. As seen in Fig. 1. 3G Shielding Specialties shield covers are typically retained to the shield frame using formed dimples. These dimples offer both mechanical retention and electrical grounding. The distance between individual dimples create electrical apertures. As application frequencies increase the distance between dimples must decrease to ensure acceptable shielding effectiveness. A limitation exists with respect to the minimum distance between dimple features, at which point the insertion force of the cover can lead to deformation of the cover or fence resulting in the failure to provide adequate shielding effectiveness. Fig. 1. 3G Shielding Specialties Shield frame with cover using retention dimples. As frequencies increase in shields designed with discrete cavities the likelihood of inter-cavity cross-talk increases. As seen in Fig. 2., regardless of the number of cavities, the only retention point continues to be the shield’s perimeter. While positive grounding exists at the perimeter there is no positive grounding between the cavity wall and cover which creates apertures between shield cavities. While gaskets and absorbers may be used to offer grounding between the cover and internal cavity walls their use is limited to applications with a small footprint. Fig. 2. 3G Shielding Specialties Shield frame with internal wall. At higher frequencies or where high inter-cavity isolation is required the most widely used solution has been machined housings. Manufactured from solid aluminum or brass, machined housings are typically CNC-machined, at higher volumes they may be die cast with secondary machining required. Rather than being soldered to the PCB, machined housings must be secured through the use of screws through the PCB. In the absence of solder, conductive gasket materials are used to provide grounding between the machined housing and the PCB. Since machined housing are manufactured as a single piece they provide superior inter-cavity isolation at higher frequencies. They also provide positive grounding for the entire perimeter of the shield and are not susceptible to leakage that may occur between dimples securing a board level shield cover. An additional benefit of machined housings is that they may be designed with heat dissipation features acting as both a EMI shield and heatsink. In low volumes, the cost of producing machined housings is significantly higher than board level shields. At higher production volumes costs can be reduced by migrating to a die-cast solution with secondary machining. Tooling cost, however, must be taken into account when considering migration strategies. In all cases a conductive gasket must be placed at the interface between housing and PCB. Gasket materials are typically dispensed onto the machined housings. Care needs to be taken during design to ensure adequate gasket compression will take place during assembly. The number and location of screw-attach points must be carefully considered to ensure compression is sufficient to provide perimeter and inter-cavity grounding across the machined housing. Threads in the machined housing can be damaged during installation, requiring additional rework steps prior to assembly. 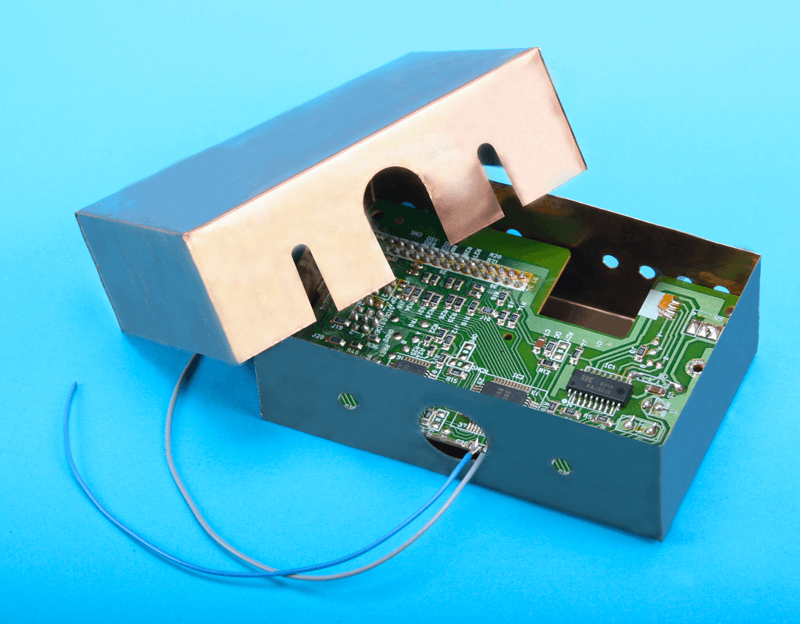 Machined housing walls are thicker than board level shields and require a significantly wider pad on the PCB. In addition, keep-out areas for mechanical attachment of the machined housing to the PCB take up significant board space and traverse all board layers. As seen in Fig. 3. board layout may be less efficient when using machined housings as they require more PCB space and reduce the ability to route via internal layers in certain areas. In addition, where a board level shield can have square corners the manufacturing process of machined housings necessitates the use of radiused corners throughout. Fig. 3. Board level layout of a machined housing (Left) vs Board level shield (Right). Manufactured from billet or castings, and containing significantly thicker wall segments machined housings result in a significant increase in the weight of the device. Both board level shields and machined housings have discrete advantages and disadvantages. Developing a solution that takes the advantages of both solutions into account results in a shielding solution that provides significant inter-cavity isolation at high frequencies. The design layout flexibility of board level shielding. In addition, perimeter leakage must be minimized or eliminated. The ability to mount to the PCB without the use of screw holes in order to minimize shield real estate is beneficial. The elimination of expensive dispensed conductive gasket materials used on machined housings. Reduced mass and cost as compared to machined housings. Allow for heat dissipation. 3G Shielding Specialties Hybrid shields were developed as a direct replacement to costly machined housings and are available as are a two-piece multi-zoned customizable shield. Providing similar shielding performance to a traditional machined enclosure, they can be produced in a more cost-effective manner in both low- and high-volume. The innovative cover design and conductive foam gasket provide excellent inter-cavity isolation while still allowing access to the underlying board. 3G Shielding Specialties Hybrid shields also require less board space and provide a significant weight reduction versus machined parts.3G Shielding Specialties Hybrid shields are manufactured from pre-plated tin-plated steel for indoor applications where corrosion is not a consideration, or from nickel silver alloys where corrosion is a concern. As seen in Fig. 4. 3G Shielding Specialties Hybrid shield frames are manufactured using the same thin gage materials common to board level shields and have a removable cover. Assembly proceeds in a similar fashion to board level shields with the Hybrid frame soldered to the PCB during reflow. Fig. 4. 3G Shielding Specialties Hybrid shield with cover, PCB side. 3G Shielding Specialties Hybrid shield covers utilize a conductive PE foam gasket in place of dispensed gaskets typically found on the PCB-facing surface of machined housings or dimples on a board level shield. Conductive PE gaskets require lower compression force compared to dispensed conductive materials which results in a decreased need for mechanical attach points and offer significant increase in isolation as compared to a board level shield using dimples. As seen in Fig. 5. 3G Shielding Specialties Hybrid shields utilize a formed perimeter flange to ensure adequate gasket compression and provide shielding effectiveness. To secure the cover and provide effective inter-cavity isolation 3G Shielding Specialties Hybrid shields utilize a formed lug with threaded insert to allow mechanical attachment of the cover with screws. Unlike a machined housing which uses screws that traverse the PCB, Hybrid shield covers are attached to the Hybrid frame, freeing PCB footprint and allowing for the same level of design flexibility found in board level shields. Attachment lugs may be placed anywhere on the perimeter or inner cavity walls and may be customized to offer additional compression around particularly noisy circuits. The likelihood of thread rework operations is greatly reduced as a result of using stainless steel threaded inserts. Fig. 5. 3G Shielding Specialties Hybrid shield with cover, showing attachment lugs. 3G Shielding Specialties Hybrid shield covers are manufactured using thicker gage materials, typically 25 mil, to ensure stiffness. Countersunk holes allow for flush mount attachment with a variety of hardware. Hybrid covers are typically lined with 40 mil conductive gaskets affixed with a conductive PSA and designed for 50% compression. As seen in Fig. 6. spot welded lugs are aligned with cover openings for mechanical attachment. Lugs are typically manufactured of 25 mil material similar to the Hybrid cover. Frame walls are constructed of 16 mil thick materials and require a 50 mil wide solder pad on the PCB plane for proper reflow. Fig. 6. 3G Shielding Specialties Hybrid shield cross-section view. In cases where thermal dissipation is required from hot components heatsink features can be easily included in the Hybrid cover. As seen in Fig. 7. aluminum blocks can be affixed to the cover. 3G Shielding Specialties Thermal interface materials can bet attached to the aluminum block to ensure adequate thermal transfer takes place between the PCB level component and the cover. In addition to heatsink features additional shielding components such as microwave absorbers may also be affixed to the hybrid cover. Fig. 7. 3G Shielding Specialties Hybrid shield cover with thermal feature. While Hybrid shields remain costlier than board level shields they offer significant cost advantages when compared to machined housings. Typically, 3G Shielding Specialties Hybrid shields provide a 30% cost reduction against comparable machined housings. In higher-volume production tooling is not required and Hybrid shield unit prices remain lower than die-cast housings. 3G Shielding Specialties Hybrid shields were initially introduced in 2015 and have been deployed in a number of applications since their introduction. In telecom, Hybrid shields are the shielding choice for 5G base stations and provide 90+ dB of isolation at frequencies up to 28 GHz. 3G Shielding Specialties Hybrid shields have been successfully deployed in Test & Instrumentation applications providing 80+ dB of isolation at frequencies up to 65 GHz. In military applications, Hybrid shields have replaced machined housings in a number of existing applications and have provided significant weight savings with comparable performance results. As frequencies increase the difficulty in providing adequate isolation also increases. The divergent needs of providing significant shielding performance while also development a low-weight and flexible solution has resulted in the development of the 3G Shielding Specialties Hybrid shield. Comprised of the flexible design elements of a board level shield and utilizing the grounding elements of a machined housing, 3G Shielding Specialties Hybrid shields provide the best of both worlds.